During Spring 2012, our Jakara Juniors camp focused on health, nutrition, and wellness. We encouraged all Sikh children to be the Guru's Pehalwaan. We have examples of inspiring Sikhs that celebrate healthy minds, bodies, and souls. Fauja Singh is the best-known, but he isn't alone. Introducing Man Kaur! Man Kaur, aged 95, of Chandigarh took up running under her son's encouragement, 72-year-old Gurdev Singh. 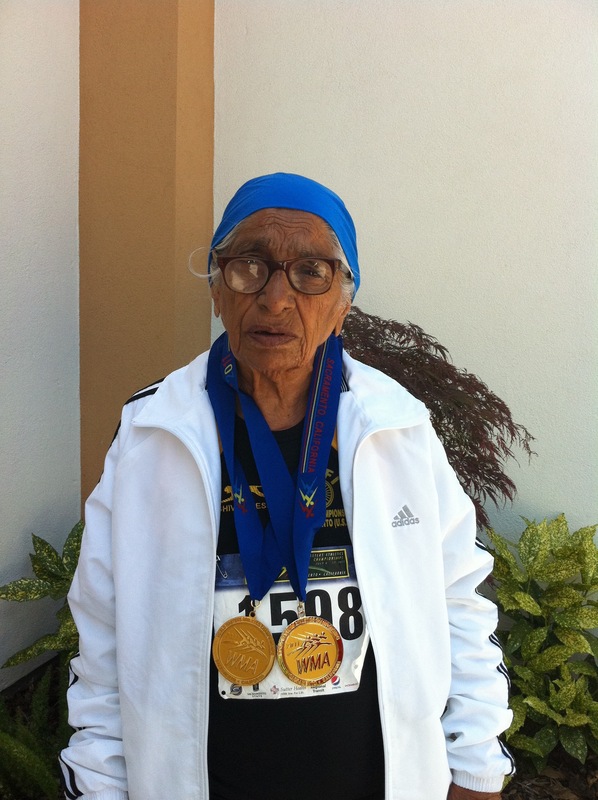 Last year in Sacramento she received two gold medals in the 90+ age group in the 100m and 200m events. The Kaur Sprinter! “My son introduced me to athletics. I was hesitant at first, when the idea of stepping into the competitive. arena was thrown at me. But now, running has become a part of my life,” said Mann Kaur, who donned the track pants for the first time in her life last month during the 32nd national masters meet. She won a gold in both the 100m and 200m races in the 90+ age category. Some have even argued that track and field athletics is one of the purest forms of sport, because it tests speed, strength, power and endurance. What ‘s more, athletic competition is so obviously and easily quantifiable – after all, the tape measure and the photofinish camera don’t lie. However to run the 100M and 200M at the age of 95 requires more than ‘merely’ great natural physical ability. Athletes at this age need a systematic and highly effective training programme carefully crafted to achieve physical ability to run a 200M race. Let us start living in Begumpura Sehar and enjoy Guru’s grace. This is meant to encourage youngsters.